This product is cheaper today ($324.95). The average price for the last 30 days: $362. Show price history. 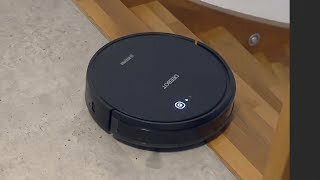 The ECOVACS Deebot 601 doesn't have a path planning feature. It comes with a random pattern that takes a little bit longer to clean compared to devices with a "mapping" feature. However, it still good for small or medium homes. The suction power of the ECOVACS Deebot 601 is not too strong (800Pa) but is still enough to clean thin carpets/rugs and bare floors. Perfect for mostly bare flooring or mixed surfaces. The ECOVACS Deebot 601 comes with an app and supports Wi-Fi that allows you to control the robot remotely.